Pin squats are a supplemental variation of the squat that can help you build power and fine tune your technique. By squatting to pins at a set point, you are able to focus on your body position at all points in the range of motion (ROM), allowing you to correct errors in your squat technique. Pin squats are similar in technique to box squats – you come to a dead stop at the bottom of the squat. However since you do not have to think about squatting down to the box, you can focus more closely on the bar path and your body mechanics as you squat. Equipment: Equipment for pin squats is the same as for power or low bar squats. Squat rack – Set the rack height at mid to upper chest height so that you will have good leverage to unrack and walk the weight out. Set the safety pins so that in the bottom position of your squat, the bar will come to rest with your hips at the desired height. You can vary the pin height, and therefore bar weight, in subsequent training sessions. Note: Don’t train with a pin height above parallel until you have mastered proper depth with the standard squat. If possible, set up the squat rack so that you can face away from the mirror. 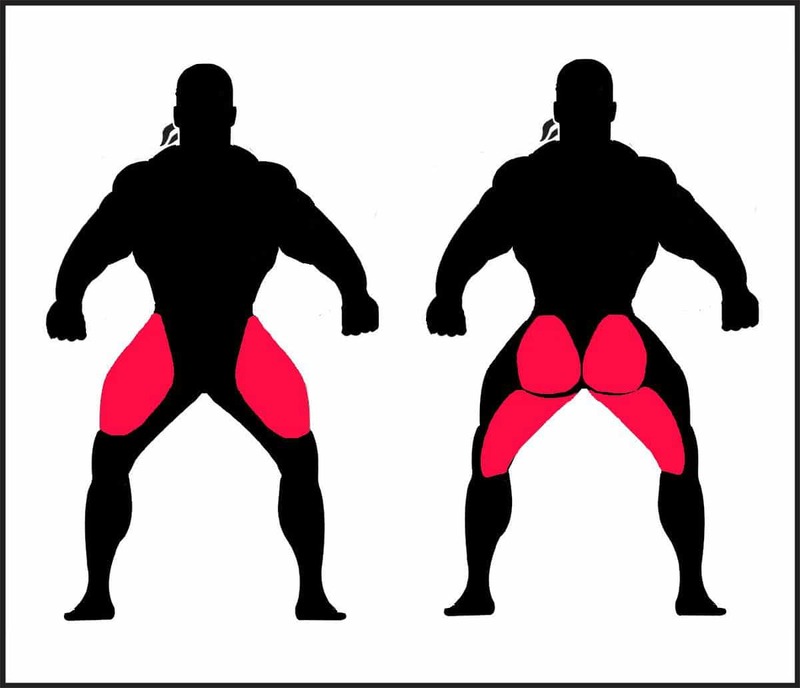 The motion of your squat in the mirror can draw your attention, distracting you from proper technique. You can also perform pin squats in the Smith Press. This will force a set bar path, and allows you to concentrate more fully on your body position throughout the ROM of the lift. T-Shirt – Use a relatively tight t-shirt. The bar will be less likely to slide on a t-shirt than on your bare skin (ie a tank top), and a tight t-shirt will keep the shirt from sliding between the bar and your skin. Chalk – For additional stability, run chalk along your back and shoulders where the bar rests. Shoes – Lift in shoes with a solid sole. Running or athletic shoes have soles that will compress under the weight of your body and the bar greatly decreasing your stability. Setting up for pin squats is the same as your squat setup. Bar Placement: Demonstrated here is the low bar position, which will give you good leverage for maximum power. The bar should rest on the back of your delts at the base of your traps. Slide the bar down your traps until you find the groove between your delts and traps. The bar should slide right into it and rest on the shelf it creates. Hand Placement/Grip: Grip the bar as close to your shoulders as your flexibility will allow. Moving your hands out further from your shoulders will reduce tension on your shoulders and elbows, but it will also loosen your upper back, reducing your stability. Conversely, bringing your hands in will tighten your upper back, increasing your stability. A wider stance increases emphasis on your hips and reduces tension on your glutes and hamstrings. It reduces your squat ROM. You may be able to compensate for long thighs in relation to your torso by taking a wider stance. It can, however, make it more difficult to hit full depth, and can increase the likelihood your knees cave inward as you squat. A narrower stance increases the stretch of your glutes and hamstrings, allowing them to aid more in the lift. With the proper foot position, a closer stance can make it easier to squat to depth. Step under the bar using the hand and bar placement as discussed above. 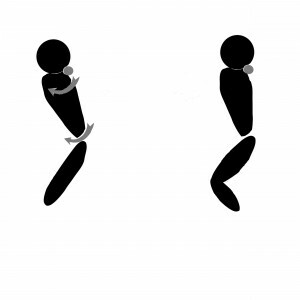 To unrack your feet should be in a relatively narrow stance, hip width apart, with your toes pointed forward (see the first frame of the walkout diagram below). Take a deep breath, filling your lungs and abdomen completely with air. Drive the air down and tighten your core, blocking to create intra-abdominal pressure and stabilize your spine. Rotating your torso as a solid unit, drive your hips forward under the bar. Lift the bar straight up out of the rack using strong leg/quad drive – the bar should pop right out of the rack. Let the bar settle before walking out. Watch your feet as you walk out to ensure correct placement. Take three short, quick steps back from the rack to set up. Take one foot straight back to clear the rack then move the other back into the lifting position. Finally move the first over into lifting position. The fewer and shorter steps you take, the less energy you will expend. Point your toes outward as shown in the diagram. This will help you push your knees out during the squat, and sink into the hole much easier. When ready to squat, take another deep breath into your lungs and abdomen and block again, tightening your core and holding the air in. Begin your descent by driving your knees outward and sit down into the squat as if sitting into a chair. Maintain the bar path in a direct line over the center of your feet all the way down pins, and back up to the starting position. Focus on maintaining proper body position throughout the full ROM: back remains flat without excessive forward lean, knees are pushed outward and do not drift forward past the toes. Don’t anticipate the pins, squat down with your normal tempo until the bar hits the pins. Let the bar come to a complete stop before driving back up – don’t bounce off the pins. Alternate the height of the pins to vary the training stimulus: set the pins at proper depth below parallel to work on squat technique through the full ROM; raise the pins just above parallel to train technique at higher bar weights. Drive the weight back up to the starting position. Drive your knees outward to initiate movement up off the pins. Begin to exhale once you pass the sticking point and continue breathing out as the lift completes. Don’t let your hips rise ahead of the bar; your hips, shoulders, and the bar should rise initially at the same rate. Complete the lift by locking out your knees, squeezing your glutes to drive your hips forward and bringing your back fully erect. Come to a complete stop, fully locked out before beginning the next repetition, or racking the weight. Begin the next rep by taking another full breath of air and blocking. Select a weight that you can perform all of your repetitions using proper technique. The primary focus for pin squats should be to maintain body position and bar path throughout the full ROM. Because the bar comes to a dead stop, and the emphasis on technique over weight for this lift, weights used should be less than those used for standard squat working sets. You may raise the pins to increase the weight used, although typically it will still be a lower weight than used in a standard squat. Bouncing the bar off the pins: Always allow the bar to come to a complete stop before beginning the concentric portion of the lift. Bar path not straight up and down: A major function of the pin squat is to improve squat technique. A key focus of this lift is to keep the bar path in a direct line over the center of your feet. Improper body position: Avoid excessive lean; keep the back flat and chest up throughout the full ROM. Hips rising ahead of the bar: Drive your knees out as you start back up to prevent your hips from shifting back and up ahead of the bar which leaves you to complete the lift as a good morning. Rounding your back: Keep your back flat throughout the lift, using the breathing and blocking technique described. 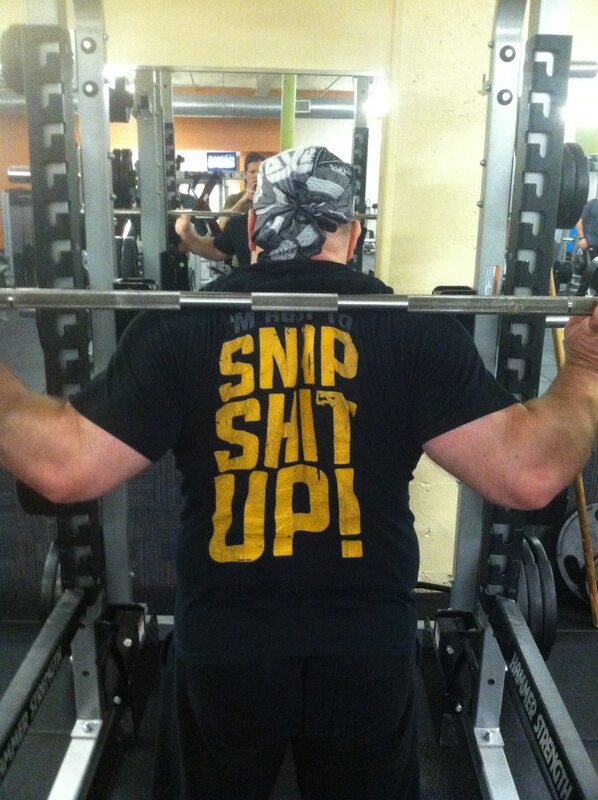 Keep your back flat throughout the entire lift. Allowing your back to round can increase your risk of injury. Stay tight when stopped on the pins prior to driving back up. Allowing your supporting muscle groups (upper and lower back, core) to loosen and lifting the weight without this support could lead to injury. Smith Press Pin Squats: Performing pin squats in the smith press will force the bar path in a direct line. Technique remains the same for a squat rack pin squat.